2. Food enjoyment = less hunger? It’s been said that ‘a sound mind is in a sound body’ since the time of the Ancient Greeks… but scientists may have just found one of the biological mechanisms behind this! This study is all about a family of chemicals called kynurenines. Which are made from the amino-acid tryptophan, a staple component of foods like turkey. It’s estimated that 95% of tryptophan in the body is broken down into kynurenine, which unfortunately is associated with many mental health symptoms in the brain, including depression and schizophrenia. But what does this have to do with exercise? Luckily, kynurenine can be broken down in muscles into kynurenic acid (KYNA), which can then no longer get back into the brain. A good thing! Getting that run may also make your muscles tell your adipose cells to start burning fat. 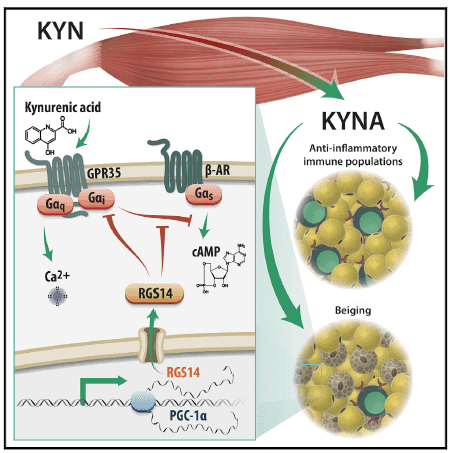 Figure 1 – KYNA contributes to the beiging (browning) of fat, which in turn burns white fat (Agudelo et al., 2018). Incredibly, when Swedish scientists injected mice with KYNA, their fat deposits started shrinking. This is because more of their usually inert white fat cells began to act more like the fat-burning brown adipose tissue. Brown fat is a rare form of healthy fat found in small amounts in humans, which burns up the white fat around it. Put simply, this ‘browning’ of the white fat made the mice burn more calories without doing any extra exercise! This is exciting stuff, but what does it mean for us NOW? We’re looking forward to seeing new research on how this works in us humans, and how different exercise routines might affect it. But in the meantime, it can’t hurt to get your recommended daily exercise. Want to master sports nutrition science? Whether you’re an athlete looking to maximise your own potential, or a professional keen to work with sporty clients, our Advanced Sports and Exercise Nutritional Advisor™ certification will help you personalise nutrition programs for different athletes. Click here to download our course catalogue now. Food enjoyment = less hunger? Can the pleasure we get from indulging food affect how hungry we feel later in the day? That’s what this pilot study tried to find out. The researchers investigated changes in the levels of the ‘hunger’ hormone ghrelin in 11 participants who were either given a meal which they truly enjoyed, or one that wasn’t quite as tasty. 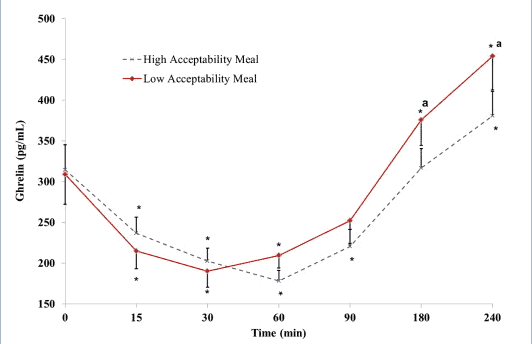 Changes in ghrelin levels during a period of 4 hours after participants consumed a high or low acceptability meal (Olabi et al., 2018). So what happened? The levels of ghrelin were increased in the participants who consumed the less pleasant meal, compared to the tastier one. Since having high ghrelin levels make us want to gobble, this study suggests that enjoying the food we eat may be an important factor in keeping us full a bit longer. Looking to help clients with their food cravings? We take a more detailed look at eating psychology and appetite neurochemistry in our Advanced Clinical Weight Loss Practitioner™ certification. Click here to download the curriculum now. But, could these food products hold any benefits to our health? According to a new study, they may help to relieve stress and anxiety symptoms. A team of researchers in Australia analysed the diet, lifestyle, and self-reported mood of 520 participants using a questionnaire. They found that those consuming yeast-based spreads reported significantly less anxiety and stress symptoms compared to non-eaters. 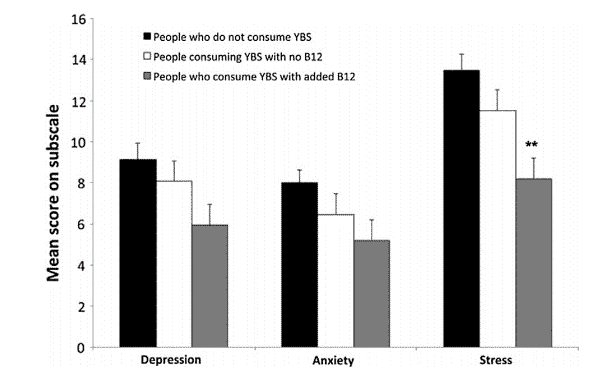 Differences in mean depression, anxiety and stress scores between individuals who consumed fortified yeast-based spreads, unfortified yeast-based spreads or no yeast-based spreads (Mikkelson et al., 2017). It’s thought that yeast-based spreads provide you with a lot of B vitamins, which appear to be important in warding off symptoms contributing to depression and anxiety. For example, the researchers highlighted that participants who ate yeast-based spreads fortified with B12 had lower stress scores compared to those consuming the ordinary spread. Again, just remember that a multitude of factors can contribute to our anxiety and stress levels, and that eating yeast-based spreads won’t probably do the trick on their own. Interestingly, I checked the nutritional composition of UK marmite and it’s quite low in sugar. See here. Want to help stressed clients using the latest science-backed methods? We’re super close to launching a brand-new certification on just that! Register here to get notified when it goes live. Love your site and look forward to your emails and updates. The exercise study further demonstrates effects of a healthy diet/lifestyle. When Tryptophan is metabolized into neuro active metabolities, like Kyurenine initially, then they branch off into( Kat) and (KMO), and produce KYNA(kynerenic acid), 3-HK, and other interesting metabolites that regulate psychological/neural functioning. 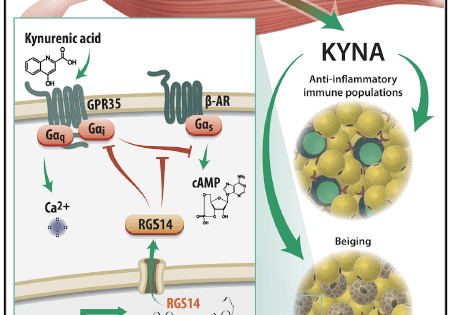 How and why KYN turns into KYNA or 3-HK, is of great interest to researchers worldwide, and has been since at least 1957. Many studies point to an overall active life style, contributing to the modulating effects of balancing the KP or Kynurenine Pathway. In any event, modest activity daily will certainly have a long term mitigating effect on degenerative neurological disease, and for certain, yield numerous benefits from changes in increased metabolism throughout the body, and impacting the GI directly, by modulating microbiome diversity! After all, their are 100 Trillion micro organisms in our GI tract…..and their balance depends on genes, diet exercise, mood/environment all playing a part. Help your body maintain homeostasis, live an active lifestyle, and eat functional foods, be well!